Several years ago, when I accepted the invitation to edit the Oxford Illustrated History of Modern China, which is already available in the UK, and will be out in North America later in the summer*, I wasn’t sure about many things. One was which colleagues I would try to convince to write several of the chapters. Another was what sort of visuals would be included. I did know two things right from the start, though, related to a topic, the Cultural Revolution, which has been in the news a lot lately, due to the arrival of the fiftieth anniversary of its start. I knew I wanted Richard Curt Kraus to write the chapter on the topic, since he had just finished a slim, smart, and stylish volume on the Cultural Revolution for Oxford’s Very Short Introductions series. I also knew that, if he agreed, I’d encourage him to include a few of the period’s colorful and varied propaganda posters in his chapter. Fortunately, Kraus said yes, and had excellent ideas when it came to posters, with ones that made the final cut including a vibrantly hued image linked to Mao’s personality cult and a lovely image of a celebrated locale known for its oil refineries done in the style of a traditional ink painting. Readers of the book will not have to wait until they get to Kraus’s chapter, however, to see Mao era posters. They will find some in Stephen Smith’s chapter on the 1950s. Even sooner, they will see in my Introduction a poster reproduced that was originally created to accompany the Cultural Revolution campaign to combat the influence of old ideas and practices. This poster, in red woodblock print style, draws attention to the mix of continuities and ruptures between the Mao years and the current moment. 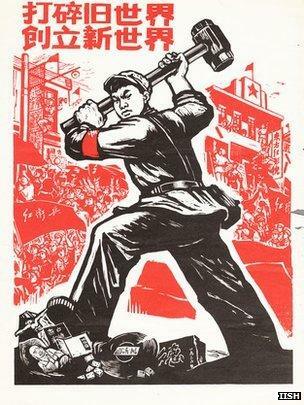 The central figure is an outsized Red Guard militant swinging a sledgehammer, which he is using to destroy, among other things, a statue of the Buddha, representing the period’s attack on all traditional forms of religion and philosophy, and a phonograph record - presumably of Western classical, jazz, or rock music, all of which were disdained by Maoist militants of the time as bourgeois and decadent. If we flash forward to the present, we find that Mao’s successors no longer take a dim view of traditional philosophy and religion. Confucius was a major focus of criticism during the Cultural Revolution, yet now Beijing is setting up institutes named in his honor across the globe. By contrast, there are echoes of the Mao era in the statements the authorities periodically make warning about the allegedly pernicious influence of Western cultural imports. Recently, for example, new regulations came out requiring Chinese television networks to get special permission before developing programs based on shows created abroad. Homegrown entertainment is better, the governing body claimed, in promoting the so-called China Dream, and socialist values - though it is anyone’s guess what exactly that latter term means in an era of megamalls, showy supercars, and an ever greater chasm between rich and poor. * Check with booksellers in Asia: some may already stock the book; others may be waiting for it to publish in the USA.